A good squash to use for this is Rugosa, or violin butternut, an Italian heirloom that, unfortunately, is not easy to find. Second to that, use a butternut squash with as long a neck as possible, as that’s the part you’ll be using. You slice it into rounds, then into wedges if you have a really large squash. Another good candidate is a big chunk of Musquée de Provence, which is easy to slice into wedges. Heat a cast-iron skillet, brush olive oil over the surface of the pan just to cover, then add the squash. Cook over medium-low heat, turning occasionally, until tender, about 20 minutes; the surface will be mottled with caramelized spots here and there. When the squash is ready, season it lightly with salt. 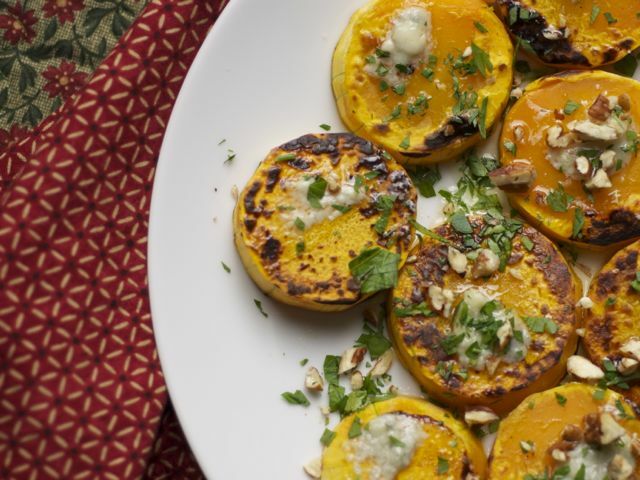 Remove the cooked squash to a plate, and spoon a little Gorgonzola butter onto each slice. Season with a few pinches of minced parsley, the walnuts, and freshly ground pepper, and serve.